1 What is most obvious when walking through the streeets and talking to local experts and lay people is the importance of private capital for (nearly) everything happening. Most obvious changes are led by private companies and by large property developers. They lead what is visible. They show what they do. And they decide how the city changes its shape – at least central parts of the city between waterfront, Midtown, and New Center. It is much of a material and infrastructure focus. In addition, it gets further to organising activities on public squares, own security personnel and public events. If they want to get a tram line, they get it. No matter if (not to say how) it integrates into the urban and regional transit network and no matter if it slows down because it runs close to parking and sidewalks. Buses run along the same corridor, but use completely different stops. It looks like an easy task to connect elements towards a coherent network. However, speed of change is amazing. Things that usually take more than a decade here in Germany happen in few years. Most building sites were quite recent. 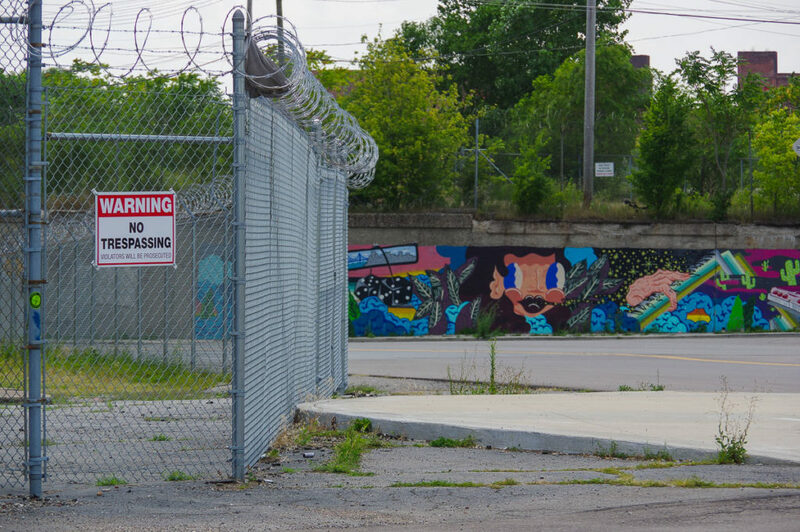 Most sites in central Detroit have a very recent story of change – following an often sad and long history of decay. For example, that was true for the El Moore Lodge in Midtown, where I stayed for a week. Many buildings that have been abandoned for decades are reused as office or apartment spaces with many new people coming to actually live in central parts of Detroit. It is obviously not the average of Detroit’s population. Most of Detroit is black (near 90%), central parts appear almost completely white. There are few children and elderly people in the core city areas. Laura Reese, Gary Sands Jeanette Eckert and Igor Vojnovic titled a 2017 article with “It’s safe to come, we’ve got lattes”. Reese, Laura A.; Eckert, Jeanette; Sands, Gary & Vojnovic, Igor (2017). “It’s safe to come, we’ve got lattes”: Development disparities in Detroit. Cities, 60: 367–377. doi: 10.1016/j.cities.2016.10.014 . 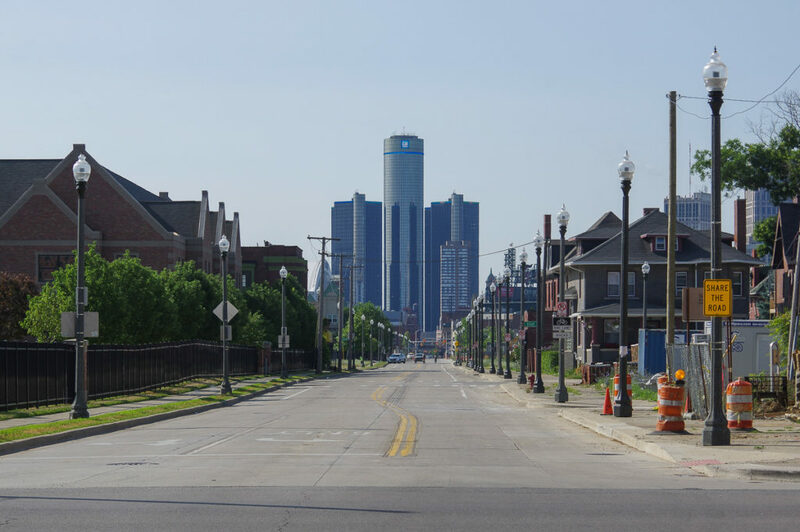 The resurgence of Detroit’s central parts is a huge success by people like Dan Gilbert (Quicken Loans), the Illitch Holdings (Detroit Tigers, Little Ceasars Pizza and others). But their ultimate goal is not just and inclusive urban development, it is economic survival and growth of their companies. 2 The second important driver are private non-profit organisations and foundations. Some of them, like Midtown Inc., have played an important role for urban development in parts of Detroit over decades and including some ups and many deep downs. Their behaviour resembles a broker who analyses and arranges future perspectives and property relations. Part of the city-changing work involves arguing for a desired future, persuading others and managing ongoing processes. Another part of foundation’s work is to explore and inspire others by thinking ahead, taking the lead in developing options and experimenting with approaches. Kresge foundation, among others, was a strong supporter of many urban gardening initiatives ten years ago. Sue Mosey, executive director of Midtown Inc, has even been called “Mayor of Midtown”. It is amazing to see how much engagement, activity and passion lies in all those activities. However, it is striking to see signs like two different garbage bins next to each other: a municipal one and one of Midtown Inc. They stepped in during the worst times. They are nonprofit, but their procedures differ from those of public and democratic planning. They get much done within their area, but what is around? 3 However, when getting deeper into conversations within the city, there is an emerging other type of leadership. These are public institutions and public planning in search for a new role. Some of these institutions merely existed during the banktcruptcy years. Two roles emerge for the future. First, protecting and advocating opportunities in life for all people in Detroit against powerful forces of change. Second, designing a moderated process towards a positive future in diverse neighborhoods. City of Detroit’s Office of Sustainability has set up a huge agenda, but seems to lack adequate funding to keep up with other powerful – and less sustainable – ideas and actors. There are also some regional actors like SEMCOG (Southeast Michigan Council of Governments) with intensive datasets, but limited impacts on actual integrated policy-making. My impression remains that public planners are in a weak position and even become celebrators of minor successes to be seen at all. 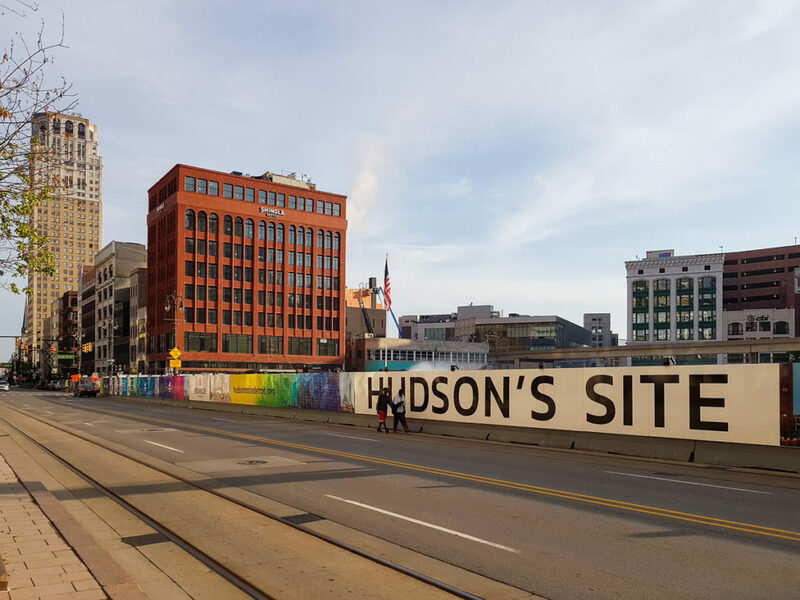 Instead of the enclosed habitat in downtown and midtown, they focus on less advantageous part of the city where positive change is much more difficult and unlikely. There is not much to gain where most hope has left. Large successes may look small. This would be where a city-wide and regional picture is of crucial importance. To balance across different parts. Why does a tram line (the Q-Line) stop right where the problems start? Core of public transport is to connect, not to seperate. 4 Last, there is a fourth group. It is many very local activists, artists, musicians and engaged citizens. Detroit still seems to provide much space for all of them. In buildings that look abandoned, in places that give room for any idea. Eastern Market had its international mural festival. Northern suburbs host important techno music venues. These are people building up their own neighbourhoods and communities. Staying together in difficult times. Exploring what is possible. Sometimes supported by small foundations, religious organisations or alike. Much of this today happens around the prosperous parts of downtown and Midtown. But there is a fear of being phased out by growing economic pressures, increasing rents and land prices and a different type of people ‘taking over’ their neighbourhoods. Eight years ago, 5,000$ have been enough to buy a house that is worth 60,000$ or more today. Even though the surrounding has not (or not yet?) changed much. Lots of these small-scale activities are not visible at first sight. But they have positive impacts on those that have suffered most during the last years, sometimes decades. One could easily say: what’s the problem? Many different actors engage for the city and its development. They take many different roles. They make a difference in how Detroit changes its shape and atmosphere. In other ways, they lead Detroit’s change. However, they are hardly connected. To me, it looks like a collection of individual actors and seperate places, but a city is one of connections, of flows, of people, of emotions. And, ultimately, a city is where differences (and often dissent) find physical or mental places to meet. A city is not a collection of individual and seperated places. It is connections, flows, people and emotions. Ultimately, a city is where differences (and often dissent) find physical or mental places to meet. If visiting Detroit as a foreigner, some of the striking problems might not be obvious. When walking through downtown and Midtown, we might see some modern and hip urban culture emerging – like in many other cities around the globe. But development is hugely polarized and segregated. Strikingly, most people I have talked to use the term ‘place-making’. Which means different approaches, but always connects to confined places or small neighbourhoods within the city. This approach works well for individual projects. But it reaches a dead end to target regional issues (most importantly public transport, but also land-use changes, education) and it has nothing to say against forces tearing a remaining spatial cohesion between all Detroiters apart. Who works against fences, for a colorful city? “Money first! Investment first!” – That summarizes many clear statements. A more coherent strategic vision could be the next step. And true, the city has suffered a lot, with little or no support from outside and from higher levels of government. In my opinion, having coherent ideas about the future should nevertheless be the first step. Not every investment is beneficial for a neighbourhood and the city. Even if it is, where does public accountability for broader issues come in? Some approaches – like Detroit Future City – have been taken by private or non-profit actors. But if it comes to actual changes, their impact is difficult to discern or limited to individual places. There is a good urban planning education at Wayne State University. With numerous graduates staying within the city or region and working on change. It was unexpected for me to see them across all the four groups of actors and enacting all the four roles I have outlined above. I have experienced them showing enormous engagement, intense work and uncountable ideas. Individually, they all have a vision for the future. These visions are not even radically different from each other. 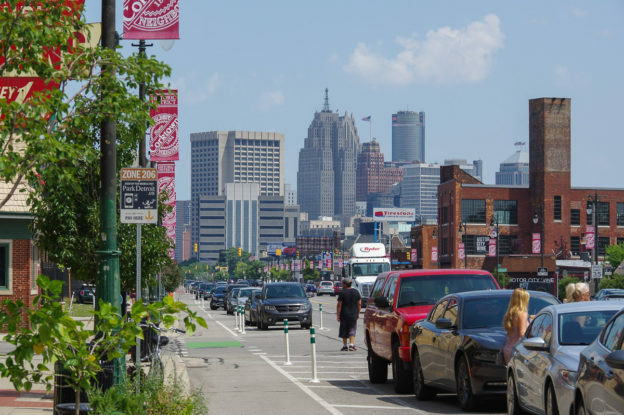 Detroit has people with ideas and skills to work strategically, to connect individual places and to think of Detroit as a city that is more than a mere ‘growth machine’. It may need some trigger to bring many good approaches together to integrate and make them work. The real challenge ahead is not to think about the best role of planners for Detroit. And not to analyse ideal ways of leadership for urban change. There is much of that. Planners in the broad sense – all those people actively engaged for the organization of space – abound. Leaderhip is distributed among many. But: who holds all this together? Change alone might hold some virtue after bankruptcy. Today, having change alone cannot be sufficient. Having said all this, the very last part is: what is legitimate? 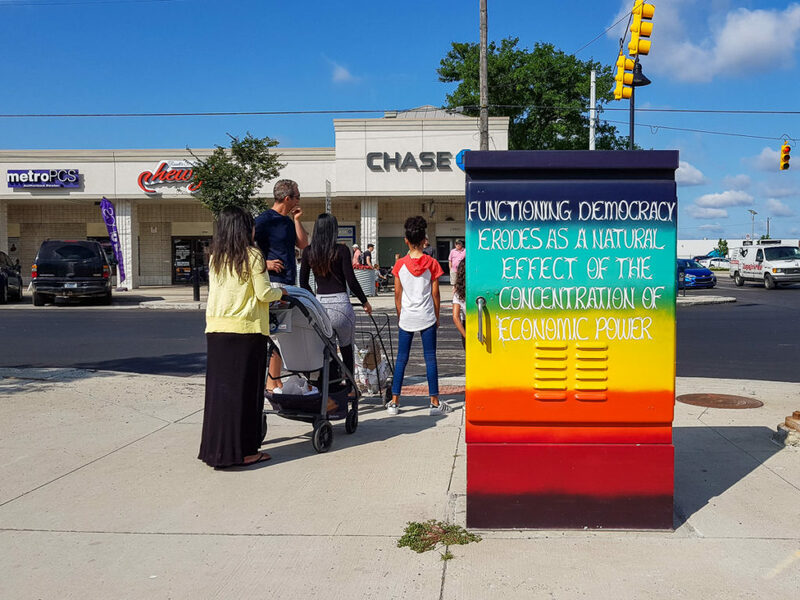 A power transforming station at Eastern Market says “Functioning democracy erodes as a natural effect of the concentration of economic power”. Detroit has a huge concentration of economic power and urban development power outside of public accountability. The question is less if Detroit changes, but if it the change that people in Detroit want and if they get the change to plan for it and with it. This posts summarised some ideas that emerged in my mind. I am curious to see how changes unfold during the next months and years. And which of the four roles becomes most important for leadership in the resurgence of Detroit for the benefit of all its Detroiters. Acknowledgements: Thanks to everyone in Detroit – from professionals, researchers, students to locals in bakerys and in Lyfts and Ubers – for many insightful talks and inspirations. And, yes, I had some lattes in Detroit.